I loved Halloween far FAR more than I expected to. While I was impressed by the trailers, I was worried that it wouldn’t have much to offer. And while it admittedly relies on what fans love best about the franchise, this latest addition brings a lot of great new things to the table. 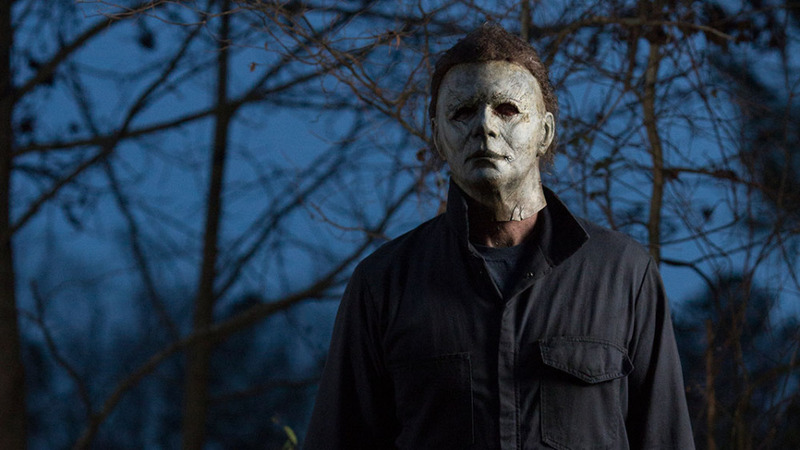 Halloween begins exactly forty years after the original film. Laurie Stroud is now living in a heavily guarded home in a remote part of town. She doesn’t leave often, and has built up an arsenal of weapons and gadgets to keep her safe from Michael Meyers’ potential (anticipated…???) escape from the institution for the criminally insane in which he is now housed. She knows that he has unfinished business. But so does she. The film focuses mostly on Laurie and her granddaughter, who’s mother has always cast Grandma as a bit of a loon - someone who experienced trauma in her teens, and who continues to “allow” it to rule her life. And it’s not without warrant. Laurie raised her daughter in an environment rife with fear and paranoia, teaching her how to shoot a gun at age eight, training her in hand to hand combat, warning her that Michael would reappear, etc. and there’s a sense of resentment on her daughter’s part that she had to suffer this unusually stifling upbringing. And forty years later, Laurie is still declaring Meyers’ eventual comeback, despite every sign that his reign of terror is over. You can feel the tension between mother and daughter throughout the film, and when Laurie shows up to dinner one night drunk, her daughter has had enough. The way generational trauma is explored in the film is truly fantastic. We see the impact that Laurie’s horrific experience has had on her relationships with both her daughter and granddaughter, for better or for worse. Halloween allows the space for these relationships to be complex and shifting things. We see both love and exasperation swirling amongst the group of women, and it’s understandable and believable. This is a film that couldn’t have existed in the same way prior to the MeToo movement. The idea that women who have been traumatized often have to defend the fear they continue feel, sometimes even to other women, runs throughout. But its also an uplifting film that shows us that cycles of fear can be broken - the next generation can choose different paths. In one of the more powerful scenes of the film, we see Laurie’s granddaughter holding onto a knife, a knife she never let go of throughout her encounter with Meyers. While in the original we see Laurie drop the knife again and again, letting down her defenses in the presence of a man trying to kill her, her granddaughter never lets go. And while Halloween approaches these serious topics in a smart and refreshing way, it still manages to be a load of fun and scary. Meyers is still terrifying - his mask now withered and dirty from years of disuse, which somehow makes him even more frightening. His relentless savagery is still intact, and the question of “why” still hangs around him like a shroud. There are some side characters who have some fantastically funny lines/moments, and Haddonfield still has that dream-like wholesome quality that made the intrusion of such terrible evil in the original even more shocking. There’s also the thing we fans live for - nods to the original film - peppered generously throughout. If it’s been awhile since you’ve seen the first, go back for a little visit to Haddonfield. It makes this new one even more satisfying. This is a good one people…go see it!